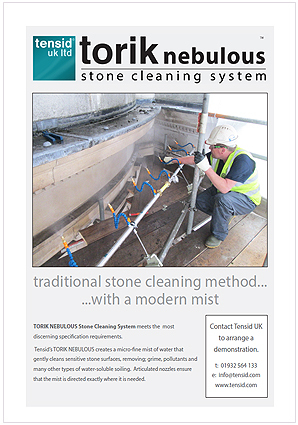 TORIK NEBULOUS Stone Cleaning System meets the most discerning specification requirements. Tensid’s TORIK NEBULOUS creates a micro-fine mist of water that gently cleans sensitive stone surfaces, removing; grime, pollutants and many other types of water-soluble soiling. Articulated nozzles ensure that the mist is directed exactly where it is needed. Contact Tensid UK at 01932 564 133 or email info@tensid.com to learn more.